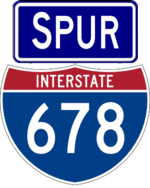 I-678 has a short spur that functions as an extension of the Whitestone Expressway through the complex interchange between I-678 and the Grand Central Parkway near LaGuardia Airport. The road is not officially considered a freeway and does not even have a reference route number. This road was constructed as part of plans to build the Astoria Expressway, which would have connected to I-278.